I recently read an online article in which the author argued that any decent, morally conscious individual should adopt the vegan diet. Since I never thought of myself as entirely ignorant on matters of ethics and morality, I was intrigued by this opinion piece. 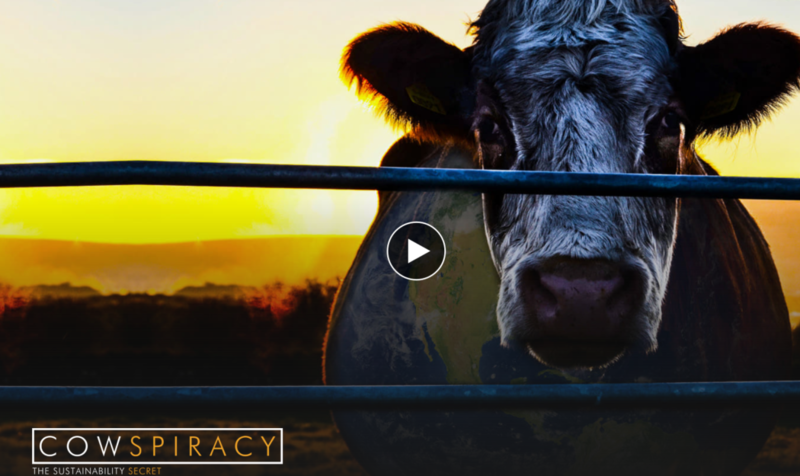 The author of that article began by recommending the documentary “Cowspiracy: The Sustainability Secret“, calling it the kind of documentary that everyone should have seen. Well, I have now seen it. But I’m afraid it didn’t change my life. However, it did prompt me to write down some thoughts and comments I have about the movie. Perhaps it is a bit like a review, albeit a somewhat wordy one. The documentary begins with an introduction of a guy called Kip, who will be the narrator throughout the documentary. Within minutes it’s clear that Kip loves nature, and that he cares about the environment. Yet until fairly recently Kip wasn’t all that concerned with global climatic change. But then Kip watched Al Gore’s documentary “An Inconvenient Truth“, which apparently had a profound impact on Kip. It even convinced him to become an environmentalist. So today Kip only takes brief showers to save water, and does not drive a car anymore. Instead, Kip cycles his bike and recycles his trash. Kip also began supporting environmentalist organizations. But while his conscience may have been soothed by all that, Kip still sensed something was wrong. He was doing all the right things, but the environment was still not recovering. But then Kip encountered this UN report, and it turned out to be an eye-opener for him. The UN report in question stated that animal agriculture is responsible for most of the anthropogenic greenhouse gas emissions on earth. And from that moment the documentary begins to focus on Kip’s investigation into why environmentalist organizations largely seemed to ignore that fact. The main thread of the documentary consists of a lengthy series of interviews with environmentalists, activists, and scientist, and frequent summaries of the main points using cartoony infographics. Most of the interviews revolve around answering the question of why many environmental groups gave so little attention to the impact of animal agriculture on the environment. But beyond a couple of serious academics—who at least appear to be somewhat impartial in all this—quite a few of the interviewed experts appear to rank among America’s staunchest environmentalists. Many of whom have apparently also authored vegan books, or sell vegan products, or fought expensive legal battles against the cattle industry. Yet I would have dismissed my misgivings about the potential lack of impartiality if only the documentary at least stayed on topic, focusing exclusively on the connection between animal husbandry and global climatic change. Instead, the documentary also talks about issues that have nothing to do specifically with animal agriculture and climate change. Here’s just one example to begin with. One moment we’re hearing environmentalists discuss the effects of agriculture on the quality of coastal water. But the next moment Kip begins talking about fisheries in general, as an entirely new separate “problem”. When one of the so-called “experts” even makes no distinction between normal fishing and overfishing, Kip tells us that all fishing is inherently unsustainable. But what does fishing have to do with climate change? Why doesn’t Kip make a documentary about fishing instead? No, instead the viewer is just told that fishing of any kind is bad, and that veganism is the only sustainable option. And when one expert in the documentary attempts to add some nuance to that assessment, he seems to be somewhat ignored when the interviewer rambles on about not being able to see how sustainable fisheries could work. And then there’s the conspiracy bit. The narrator is surprised to learn that some environmentalists are monitored by law enforcement agencies, because of fears of terrorist activities. But is that so strange? Animal rights extremists are known to resort to terrorist tactics. They commit arson, they destroy property, they even make death threats to animal researchers. Thus I think it would be the mark of a poor law enforcement agency if it did not monitor extremists, especially within groups whose sympathizers have in the past not eschewed the use of violence. But then some financial backer pulls out of Kip’s documentary and voilà, it’s a conspiracy. Oh excuse me, a ‘cowspiracy’. What kind of conclusion is that? The documentary touches a controversial topic, so naturally investors are going to think twice about having their name associated with that kind of project. But does that really prove it’s a conspiracy? I’m not convinced. Not even when the narrator interviews some guy who used to be a farmer, who once said something on the Oprah Winfrey show that the cattle industry didn’t like and got sued for it. Is that really a conspiracy? Or is it simply just another example of frivolous litigation in the United States—a practice deserving of its own documentary? And lawsuits are common tactic in every big industry. Take the tobacco industry, for example. Now there is an industry that is founded on the principle of marketing and selling a well known addictive and incredibly toxic product, and has demonstrably lied about that fact. And they’ve also successfully sued people for speaking the truth, which more than anything else shows that the truth doesn’t really enter into it. Whether it’s the tobacco industry, the energy industry, the automotive industry, or the cattle industry; it’s all about protecting financial interests, and buying enough clout with politicians to do so. It’s not a conspiracy, and it’s not personal… it’s just business. And this kind of sidetracking happens throughout the documentary. In fact, I realized at some point while watching it that the documentary had shifted so far from the impact of animal husbandry on the climate, that I wondered why the title isn’t just “Animal agriculture and fisheries from the perspective of disgruntled vegan animal rights activists”. For example, the narrator visits an animal sanctuary, for ‘rescued’ farm animals. Then the narrator visits a farm and discovers he cannot stomach the slaughter of animals. He also visits a company that’s developing vegan alternatives to meat. And the narrator interviews a Dr. Michael A. Klaper (M.D. ), who appears to be some kind of fanatical vegan guru. As a matter of fact, the interview with this medicine man was so riddled with obvious errors that I decided to dedicate a paragraph to it in this review. For example, Dr. Klaper tells us that vegans can get all the nutrients they need out of a plant-based diet. This is simply incorrect. There exists no plant-based source for vitamin B12, and humans have lost the ability to synthesize this vitamin because we evolved to obtain it from animal sources. Furthermore, those who follow a strictly vegan diet also risk a vitamin A insufficiency. And doctor Klaper also suggests that adopting a vegan lifestyle will result in a light, trimmed body, and that veganism enables you to work long hours. Another false fact, since there are plenty of vegans who don’t have light, trimmed bodies. For example, Captain Watson of the Sea Shepherd Conservation Society is a well known vegan, but I doubt anyone would characterize his physique as particularly “light” or “trimmed”. Your physical condition simply reflects eating with moderation, and getting sufficient exercise. But my favorite bit during that interview is when the narrator asks the doctor about his opinion on drinking milk. Doctor Klaper informs us that milk is—and I kid you not—”baby calf growth liquid” that is intended to turn a 65 pound calf into a 400 pound cow as quickly as possible. He goes on to say that drinking milk causes several medical problems, ranging from ‘manboobs’ (gynecomastia) to serious uterus diseases that require surgical procedures to remedy. Well, oddly there appears to be no conclusive evidence for any of those problems on the wikipedia page. And describing a food in a exaggeratedly ‘clinical’ way, to emphasize your biased opinion that such food is not intended for human consumption, is something you can do for almost any food. Take potatoes for example. Potato tubers are plant organs that play a role in energy storage and asexual reproduction, and they contain deadly toxins. Does it make your mouth water when I describe potatoes in this fashion? Probably not. But speaking as a biologist, I can assure you that potatoes did not take millions of years to evolve the ability to synthesize deadly toxins, only to have some sweaty Texan in a fastfood joint off the I-10 near El Paso extrude them into long cuboids, deep-fry them, cover them in salt, and serve them with ketchup to a giggling group of pimple faced adolescents. So does that mean we should stop eating french fries as well? I don’t think so. This documentary began promising, but ultimately disappoints by frequently going off-topic and on some points even getting the facts wrong. The FAO has even drafted a document highlighting a few factual errors. And many of the cartoony infographics used throughout the documentary seem to use ‘big numbers’ only to make the statistics sound more impressive. But just a big number without its proper context is really of little value. For example, one infographic informs us that all human beings put together eat 21 billion pounds of food per day. Gosh, what a big number. But so what? Spiders eat 400 to 800 million tons of food per year. That’s a lot for a critter as small as a spider. Does that mean we should start converting spiders to veganism too? Another infographic informs us that we keep 70,000,000,000 cows. As if humans are the only organisms to practice animal husbandry. Some ant species keep a herd of aphids. And how many aphids combined do you think those ants keep? There are an awful lot of ants and aphids after all. Wouldn’t surprise me if they’d sneeze at a paltry 70 billion cows, if only their tracheae permitted them to do so. “Amateurs!”—they might well say. So must we take action against those ants as well? The methanogenic symbionts of arthropods are responsible for a substantial amount of the annual methane emissions. “Ah, but how much methane do aphids specifically emit into the atmosphere?”—you may well ask. Well admittedly, not a lot (see Table 1). But the documentary also spends no time at all researching current and future methods of reducing methane emission from animal agriculture. And speaking of insects, the documentary also failed to look into the use of edible insects as alternative source of animal protein. A missed opportunity, if you ask me. So after watching the documentary, I am left with a very strong inclination to believe the whole thing is basically just a whole lot of vegan propaganda. Animal products are the only natural source of vitamin B12 for humans, for example. People who follow a strictly vegan diet without careful planning are at greater risk of malnutrition, such as vitamin A insufficiency. The less optimistic prognosis for the development of the world population is 36.4 billion people by the year 2300. Out of 65 studies on the carrying capacity of the earth, most of them estimate the limit to be less than 8 billion people, and in all but a few ridiculously optimistic scenarios it is still below 36.4 billion. So even if the whole of mankind adopted veganism today, we would still need to discuss how to manage the growth of the human population. Yet the documentary wastes little time dismissing the human overpopulation problem. And another somewhat problematic claim, mentioned multiple times, is that the deforestation of the Amazon rainforest is due to animal agriculture. Alarmingly, we are informed that this deforestation takes place at a rate of 1–2 acres per minute. And this is a serious matter because, as the narrator tells us, the combined rain forests are the lungs of our planet. Well, there are three problems with this argument. To begin with, the Amazon rainforest is positively enormous. It covers an area of 5,500,000 square kilometers, which means that it would take over 1,700 years to remove all the trees at that rate. How oddly slow deforestation seems to take place, when you don’t express it as the number of football fields per baseball innings. In fact, one recent report even shows that the rate of Amazon deforestation has actually decreased in the past decade. The second problem is that the rain forests are not the “lungs of the planet”. Though I do not contest that trees contribute a fair bit of the oxygen (about 25%), their contribution is dwarfed by the 40–80% of atmospheric oxygen produced in the oceans by algae and cyanobacteria. The “aqualungs of the planet” would therefor be a more apt way to put it. Finally, the third problem with this cattle-equals-deforestation argument concerns the distinction between proximate and ultimate causality. By and large, the proximate cause of deforestation may very well be to create pastures for raising cattle. But the ultimate cause is quite different, because the real issue here is that the local population simply needs to earn a living. And rest assured that if the local population were forbidden to chop down the trees to grow cattle, then they would surely find plenty of other reasons to chop them down. They would chop the trees down to grow cocaine, or they would chop down the trees to mine for minerals, or they would simply chop down the trees to sell wood…from the trees they…erm, you know… chopped down. The makers of this documentary demonstrate a similarly poor grasp of economics on other points too. For example, the documentary ends cheerfully with the optimistic message that if we all decided to stop eating animal products tomorrow, that it would change our world for the better. But that seems a bit unlikely to me, since the FAO informs us that the livelihoods and food security of almost 1.3 billion people on this planet depend upon livestock production. So if we stop eating meat today, then what jobs are those 1.3 billion unemployed, destitute, semi-literate peasants going to do instead? Become brilliant software engineers and rake in millions working for some hipster startup in silicon valley? Just call me an old fashioned stick-in-the-mud pragmatist for not cheering along with these bearded “kum ba ya” singing idealists, but I find myself coming up rather short on optimism on this one. It’s such a shame that a documentary broaching a topic of immense importance is ultimately mired by its lack of nuance, contains a number of non-trivial factual errors, ignores relevant information on related topics (e.g. scientific research on reducing methane emissions from agriculture), and goes way off-topic on more than one occasion. The result is that the documentary feels like a long, boring, relentless diatribe against the consumption of animal products of any kind.